The text on the page says: Isn’t it time you unleashed your inner child? Sorry it’s so blurry. I think it’s about time now, to play where the wild things are! 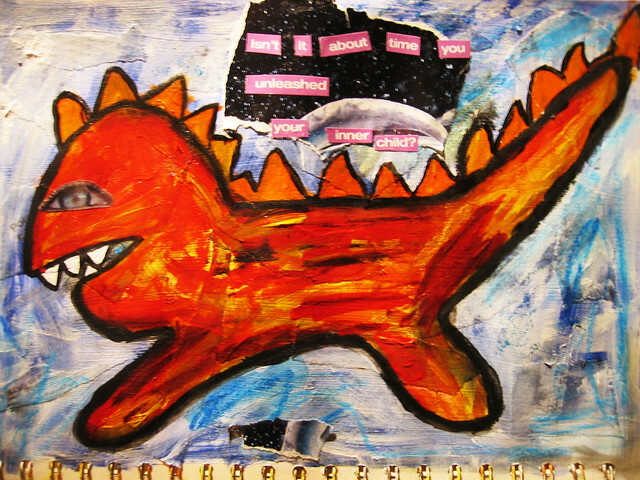 This entry was posted in Art journaling and tagged monsters, studio friday. Bookmark the permalink. Most definitely! I like the looseness of this illustration. Oh I looooove yoru wild thing monsty!!! yay for unleashing the inner child and sending your IC off packing to the ICC!!! Sooo wonderful, Hanna, keep painting, I absolutely love it, you passion shows through it and keep on shining your light!!!! This looks so fun. Love it! I LOVE monsters, Hanna! And yours is really great!